Dr. Alan Pitt finished his medical school at University of Arizona College of Medicine and did his internship at the same university. 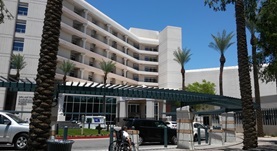 He then completed his residency program at University of Texas Southwestern Medical School and his fellowship at Barrow Neurological Institute. Dr. Pit is specialized in Radiology and board certified in Neuroradiology and Diagnostic Radiology. He has been in practice for more than 20 years and is affiliated with St. Joseph's Hospital and Medical Center. During his career, he has also contributed to four publications of medical interest. Dr. Alan Pitt has contributed to 3 publications. Anatomical and biomechanical analyses of the unique and consistent locations of sacral insufficiency fractures. Linstrom, N.J., Heiserman, J.E., Kortman, K.E., Crawford, N.R., Baek, S., Anderson, R.L., Pitt, A.M., Karis, J.P., Ross, J.S., Lekovic, G.P., Dean, B.L. ; Spine (Phila Pa 1976). 2009-02-15. Normobaric oxygen therapy strategies in the treatment of postcraniotomy pneumocephalus. Gore, P.A., Maan, H., Chang, S., Pitt, A.M., Spetzler, R.F., Nakaji, P.; J Neurosurg. 2008 May. Incidence of superficial sylvian vein compromise and postoperative effects on CT imaging after surgical clipping of middle cerebral artery aneurysms. Dean, B.L., Wallace, R.C., Zabramski, J.M., Pitt, A.M., Bird, C.R., Spetzler, R.F. ; AJNR Am J Neuroradiol. 2005 Sep.